Prostate cancer: a new treatment option from Swedish Lund University researchers. Zelboraf for metastatic melanoma approved by FDA. Potential breakthrough in cancer research: a new treatment for leukemia had amazing results. 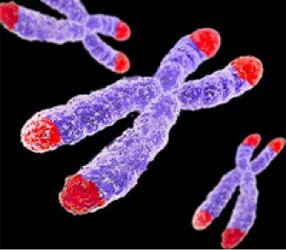 Telomeres, the complex structures that protect the end of chromosomes, of peripheral blood cells are significantly shorter in patients with familial breast cancer than in the general population. Results of the study carried out by the Human Genetics Group of the Spanish National Cancer Research Centre (CNIO), led by Javier Benitez, to be published in open-access journal PLoS Genetics on July 28th, reflect that familial, but not sporadic, breast cancer cases are characterized by shorter telomeres. Importantly, they also provide evidence for telomere shortening as a mechanism of genetic anticipation, the successively earlier onset of cancer down generations. By analyzing telomere length differences between mothers and daughters from breast cancer families, the authors demonstrated that genetic anticipation is associated with a decrease in telomere length in affected daughters relative to their mothers. The results allowed the authors not only to conclude that women carrying BRCA1/2 mutation have chromosomes with short telomeres, but also to describe for the first time that genetic anticipation in breast cancer could be explained by telomere shortening. In addition, the study expands the field of research concerning genetic predisposition to breast cancer to include genes involved in telomere maintenance. The significance of generational changes in telomere length has interesting potential clinical applications in the management of familial breast cancer, and could be extended to other hereditary cancer syndromes. FINANCIAL DISCLOSURE: This work was supported by Asociación Española Contra el Cancer (AECC) and Spanish Fondo de Investigaciones Sanitarias (grant numbers FISPI081298 and FIS-PI081120). The CIBER de Enfermedades Raras is an initiative of the ISCIII. The funders had no role in study design, data collection and analysis, decision to publish, or preparation of the manuscript. Vince Young: Young was released and is about to become backup quarterback in Philadelphia.